The Fort Knox MWR staff invited us for a visit to showcase all that Fort Knox has to offer to the public. It's really like it's own city but unique in its rich history and active military base status. There's a lot of hustle and bustle around the base so it makes for an interesting visit because not only can you eat there and find entertainment, but you also witness the work that's taking place on the base. Let me tell you a little more about our visit and highlight some tips for you. We were able to access Fort Knox with no problem. When we arrived at the Chaffee Gate, you simply pull into the Visitor's Center building that's on the left before the main gates. This will allow you to get a pass to go in and out of the gates. You can get a day pass or an annual pass. The passes are free. We gave our drivers licenses to check in and there was no line. Anyone 16 years old or older has to check in with a proper ID. Younger children check in with the adults. Once we had our passes, we drove to the gate and showed the passes to enter. And, with the passes, we can now enter through any gate, not just the Chaffee Gate. Tip: Get an annual pass. You never know when the moment hits that you want to go for a special event or to swim and if you already have the annual pass, it makes entry even that much easier. 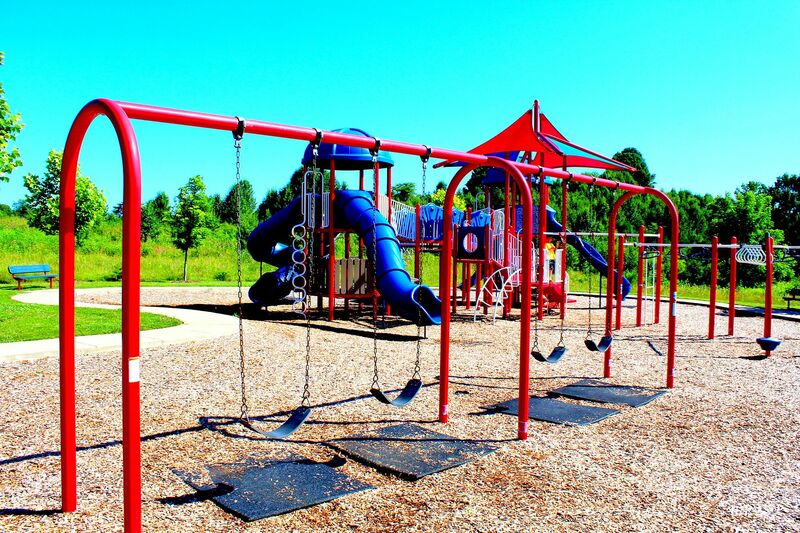 There are playgrounds all around Fort Knox. Our favorite was by the Starbucks because they had a covered seating area that's great for enjoying a latte while the kids play. They also have a fantastic playground near the amphitheater that sits atop a hill for great views and it's near a bathroom. This playground is also near the aquatics center so when that reopens soon, combine the playground and picnic with some swimming. 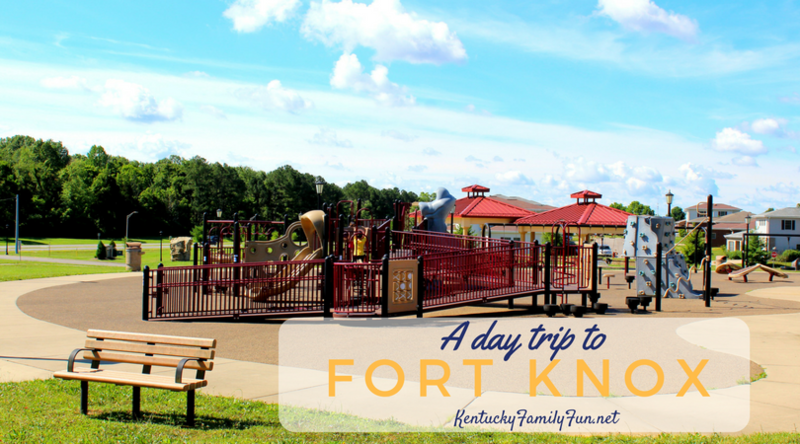 All of the playgrounds are open to the public, they were clean and updates.......so take a tour around Fort Knox for playground fun. Tip: The playground by the amphitheater has a wonderful covered picnic area. Pack a picnic lunch and enjoy! I was amazed to learn that there is such extensive programming on Fort Knox that is open to the public. I made the assumption that it is all just for military families but that is not the case. They have a wide array of community events from outdoor movies to large festivals. Just take a look at their community events page to keep tabs on events and on some of the program pages, they list the special events taking place at those locations like at the water park. Tip: Follow their Facebook page because they will keep everyone updates about special events via social media. 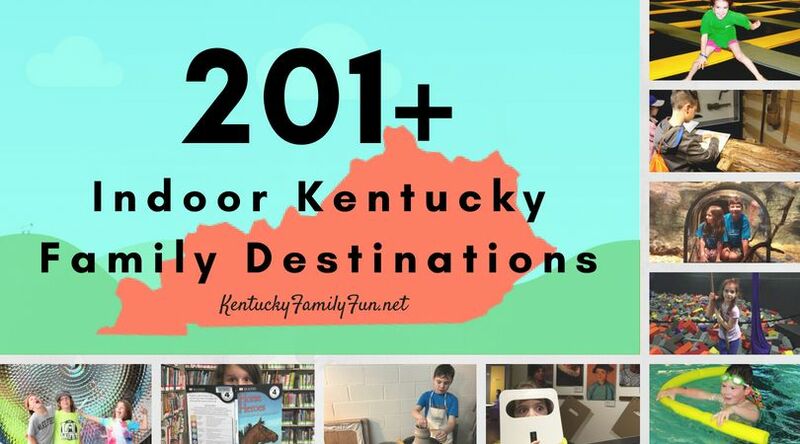 Summer is definitely the time when most families are on the move to find fun. 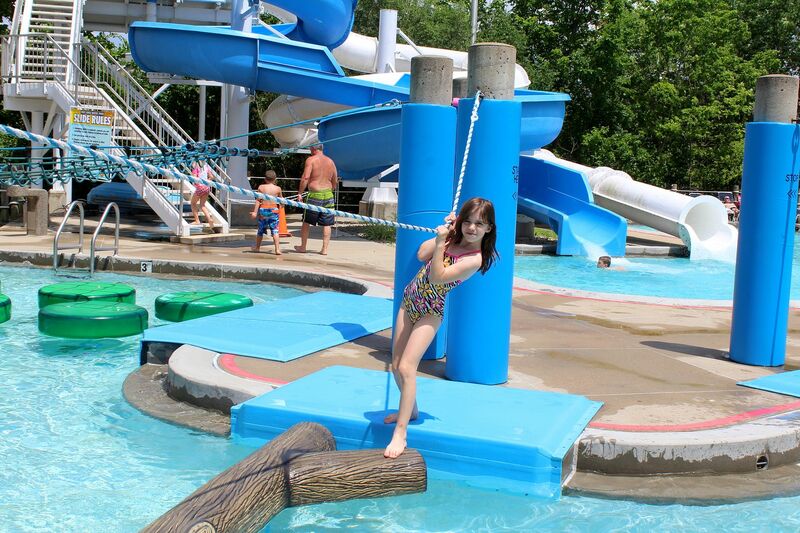 The Fort Knox water park is great for families with kids of all ages. It is very affordable at just $8 per person (civilian rate) and you can purchase a combo card for access to the water park and mini golf to save some money if you plan to do both (they are very close to each other). The water park features areas for changing and showering, lockers, a snack bar, a playground, a zero-entry area with a spraying water feature, a standard pool, two slides (one tube, one open), a floating obstacle course and a covered (yes, covered!!) and gated child's pool for little ones. There were amble chairs around and even some in the shade. My children said that they enjoyed the obstacle course the best and I loved the zero-entry area for getting just a little wet to stay cool myself......without the full commitment of jumping in! Also, it is big enough to not feel crowded but at the same time, I could sit anywhere and see my kids all over the park - that's nice and more relaxed than huge water parks. Falls Landing Mini-golf is just across the street from the water park and if you area going to spend the day, I do recommend it because it's so close. By the way, the all day golf and swim package is $8 so it's a no-brainer since it's basically free with the water park. Just be sure to mention that when you check in. 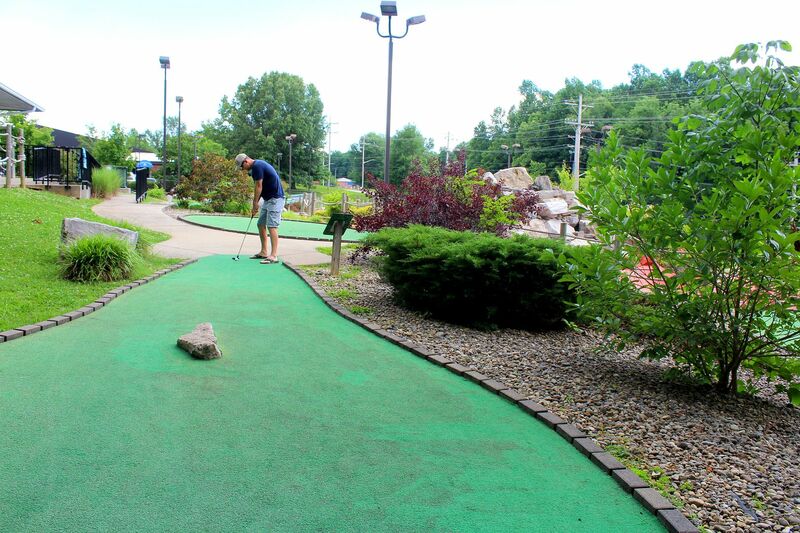 The mini-golf was not an over-the-top experience like you would see at a beach destination, it was a simple course that allowed for a fun experience and you can't beat the deal. The Anderson Aquatics Center is currently under renovation but let me tell you, when it opens, you have to go. It has a GIGANTIC indoor pool......seriously, it's HUGE. There's also an indoor splashpad. During the summer months, there is an outdoor sprayground and snack shack as well. It will likely all reopen in October 2017 and day passes are less than $5, you can even rent the place out for large groups for just $225 for 2 hours. If you have family members that like to golf.............real golf..........the Lindsey Golf Course on Fort Knox is open to the public. It's a full 18-hole course with a grill, golf shop and driving range. It's open seven days a week and the most expensive it gets for a round of golf is $25. I don't know much about golf beyond the fact that golf carts are mighty fun but I think $25 is quite reasonable. So, even if you aren't very good, at least you had a fun day riding around in the cart and you can say you golfed near the gold. 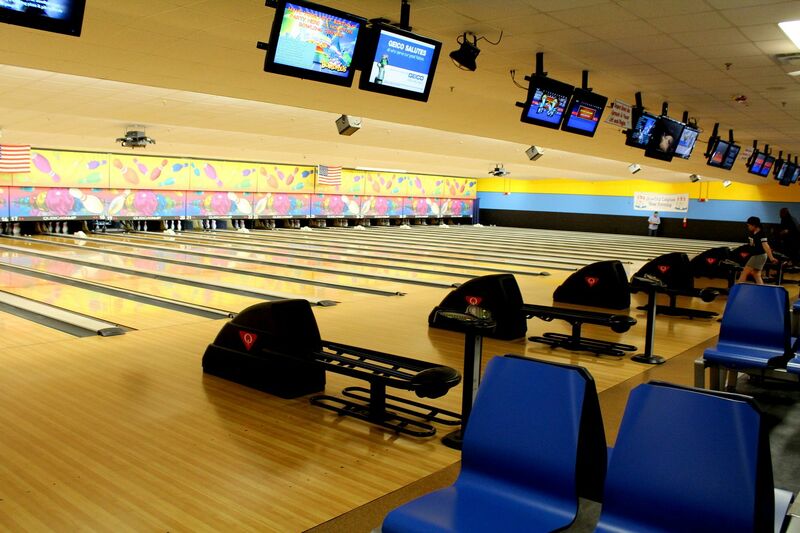 The Houston Bowling Center on Fort Knox is a clean, retro-style bowling alley that's really affordable. It is a large center so availability is plentyful. They also have a cafe that is very popular. It was under renovation there but everyone we spoke to raved about this cafe. That's a hidden gem you need to remember when you visit and you are looking to eat! Tip: If you pick up one of the Fort Knox MWR magazines around Fort Knox, there will be a coupon in there for bowling. They have a movie theater on base and they host a free movie once a month on a Sunday. Keep tabs on the calendar of events to coordinate your visit and catch one of these movies. Otherwise, most of the time, this theatre is not open to the public. We ate at two different locations during our day trip. First, the golf course cafe - the Lindsey Grill. This cafe is quick service and has everything you would want from a grill menu and I thought the prices were quite reasonable. The portions were generous! At the golf course cafe, there's a covered patio for dining outside in the shade, which we really enjoyed. Or, for more action, you can take a seat right at the grill counter - kids always love that. For dinner, we ate at Sam Adams Brewhouse. 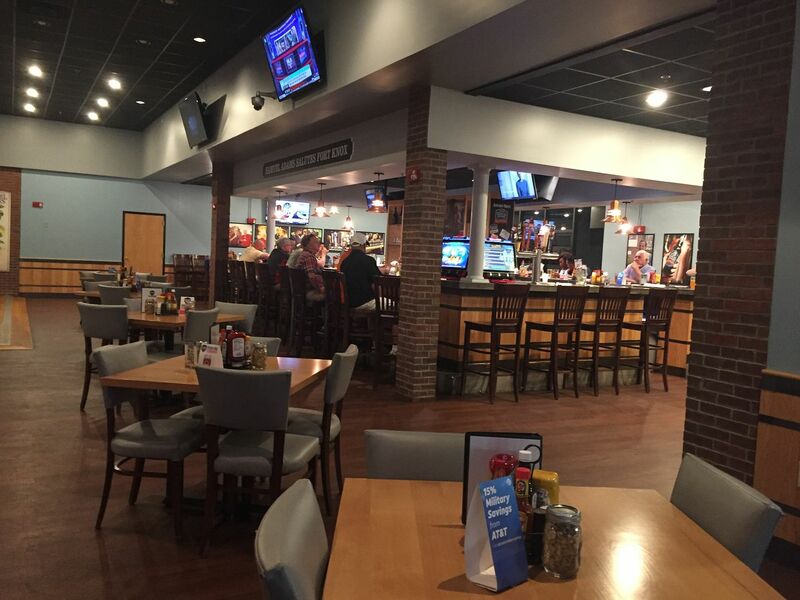 This restaurant is a family-friendly bar and grill that features an all-American style menu, a spacious dining area, a full bar and lots of TVs. Most of us had sandwich baskets that were filling and delicious but one of our hosts had the wings and he said that everyone goes there for the wings! I was very surprised at the prices since the venue seemed higher-end at first glance but the sandwich baskets were all priced under $8 and the kids meals under $3. I definitely recommend a visit to this restaurant when you are on Fort Knox. Also, there's a grill at the bowling alley that gets rave reviews. I noticed that there were some chain fast-food restaurants around the base for convenience and remember, there are great picnic areas near the playgrounds so you are welcome to bring your own food in to enjoy. You can find other restaurants here. Fort Knox does have a hotel on the base - a Holiday Inn - so if you are looking for a getaway, you can stay there because there's plenty to do over the course of a few days! 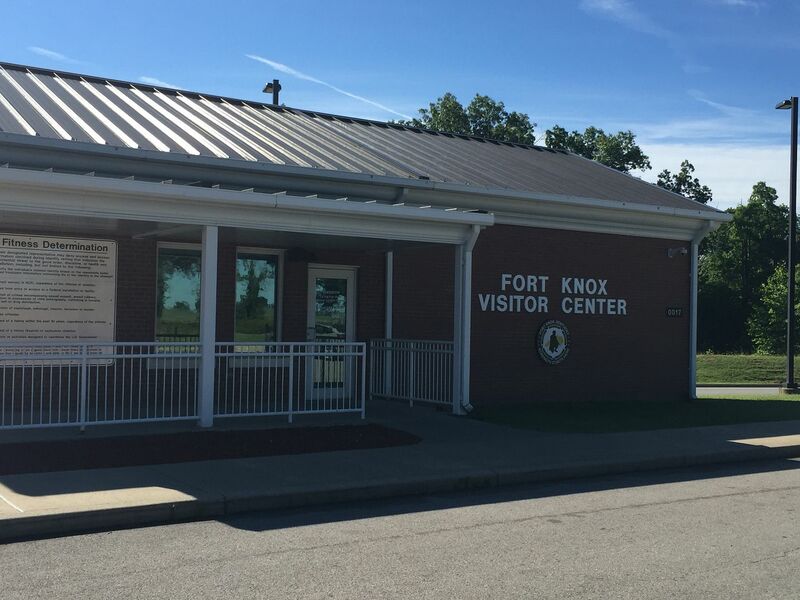 Fort Knox is not far from Radcliff, Elizabethtown or Brandenburg so you can also consider staying in hotels in these areas if you are planning a day trip or longer to visit Fort Knox. Then, you can also enjoy what these other areas have to offer. Check out Comfort Suites, it's usually where we stay for great space and breakfast included.